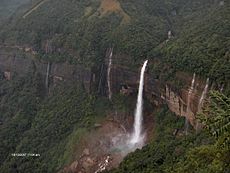 Meghalaya is a northeastern Indian state and its name means Abode of Clouds in the ancient Indian language of Sanskrit. It is bordered to by the state of Assam to its north and Bangladesh to its south. The state holds a population of approximately 2,600,000 people and its area is roughly 8,700 square miles. The capital of Meghalaya is called Shillong and is sometimes referred to as the Scotland of the east. The state was originally a part of Assam, but separated on January 21, 1972. Most of the state is covered in green forests, but there are lower elevation areas that sport tropical forests and fertile lands. The state has a lot of rock formations that contain minerals like coal, limestone, uranium and sillimanite. For these reasons, the economy here is driven by agriculture; the most prominent foods produced are potatoes, rice, bananas and pineapples. The state has a large service sector in which real estate and insurance companies thrive, but mining and public sector jobs also employ many people here. Back in 2004, the state’s Gross Domestic Product was estimated at about $1.6 billion, but it is higher now. As far as recorded history goes back, the Khasi, Garo and Janitia tribes each had kingdoms on land in his region, and they ruled these kingdoms until India was forced under British rule in the 19th century. While under British rule, the sate was placed into the Assam territory as part of that state and had some independence as a princely state (a state the British controlled, but allowed to be directly ruled by an Indian king). When India gained its independence from Britain in 1947, Meghalaya was given limited autonomy as an individual territory, but per the 1969 Assam Reorganization Act, the state was created on April 2, 1970. 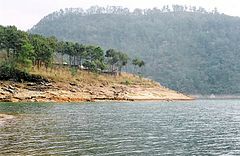 India’s Parliament confirmed Meghalaya an individual state on January 21, 1971. This state is one of three Indian states in which the majority (70.3%) of its population choose to follow the Indian religion of Christianity; Nagaland and Mizoram are the other two states with the like majority. Hinduism is the second most popular religion with a 13.3% following, while 11.5% follow an ancient Animist religion and 4.3% practice Islam here. If you plan to travel to Meghalaya, here are some things to consider: Shillong, the capital of the state, is a popular hill area where you can enjoy several water falls and it is the state’s highest point; great for trekking. There are many outdoor adventure type activities to take on in this state including, rock climbing, hiking, water sports and more! Paddle boats, sail boating, cruises, jet skis and more are at your fingertips here. and You may also have the opportunity to see rare animal species such as the slow loris, various species of deer and bears too! The state’s more than 500 natural sandstone and limestone caves are also a popular tourist attraction here and there are many lakes and water ways to explore on those boats I mentioned a moment ago. The average rainfall here reaches 1,200 in some spots and the state is considered the wettest place on land! The temperature stays pretty moderate here, with maximum temperatures rarely exceeding 82 degrees Fahrenheit and minimum temperatures falling into sub-zero territory in the winter, so pack accordingly! Leave Meghalaya to discover the other Indian states and union territories. Visit our homepage to continue to explore India.